Edit: I started writing this about three weeks ago but forgot to publish... Oops. 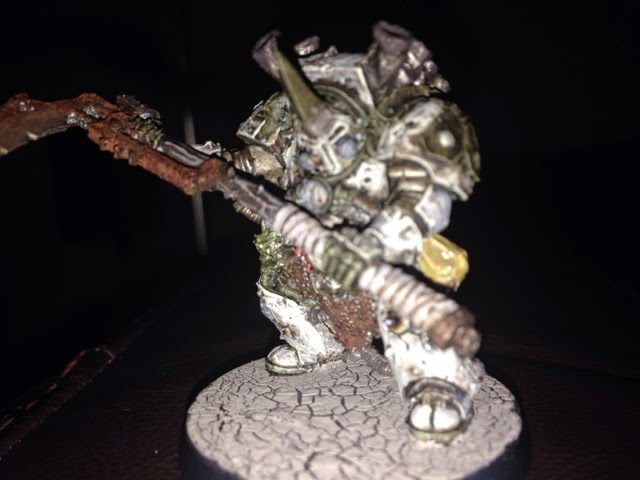 Over the weekend (and the preceding week as I was off work for two days) I've been a rather busy little bee and not only started but also finished Typhus! I have to say that I'm so happy with him and how he turned out; in fact I surprised myself with just how well I managed to paint him (not to toot my own horn or anything). Voila! One host of the Destroyer Hive. I was going to paint him a while ago so I had done my usual paint scheme research already (moving house just screws everything up). What this meant was that I could start painting straight away. I chose the pre-heresy Death Guard scheme for two reasons. 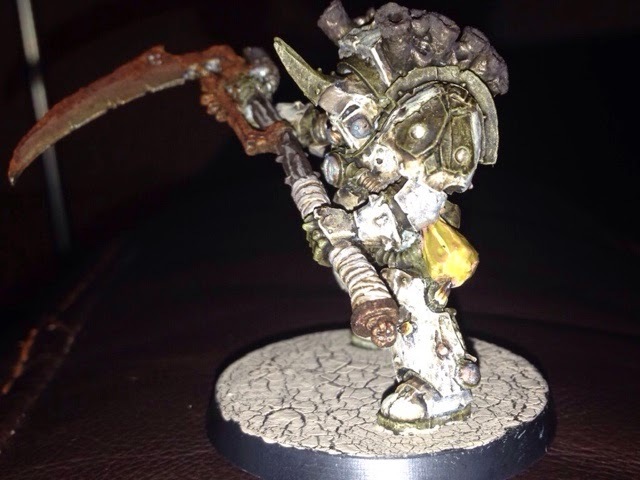 The first reason is a fluffy one in that that after being infested by the Destroyer Hive and becoming a mortal (ish) herald of Nurgle I very much doubt he'd have cared all too much about how his armour looks so it never made much sense to me that he would have re painted it. 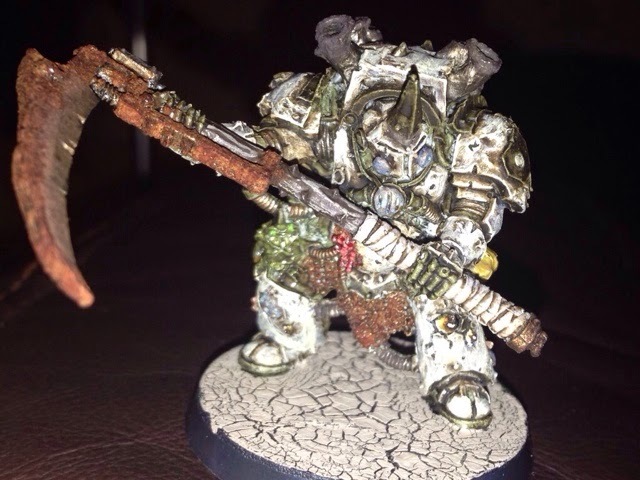 The second reason is that I saw a few pictures of both this model and the Forge World Typhon and thought that the Death Guard colour scheme was so much cooler than the green one. To get the green trim I painted the whole model with Death World Forest. Then dry brushed with Elysian and Nurgling Green with copious amounts of Agrax Earthshade between layers. 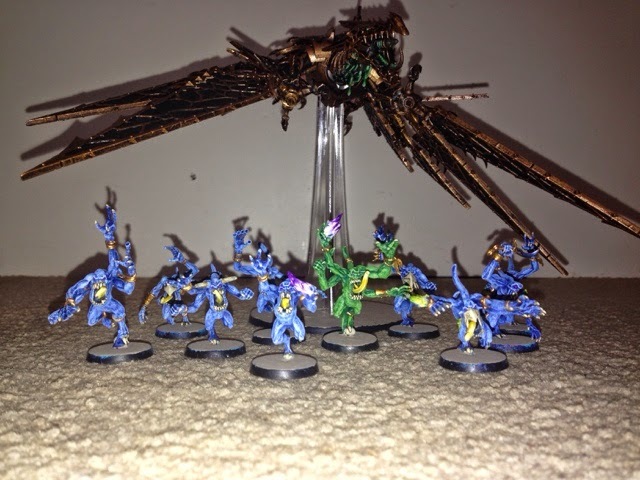 Since this model there has been a lot of work done in terms of my hobby (and the rest of my life but this is about the hobby) including the beginnings of a new army... Which is something that anyone coming here from my Twitter links will already be aware of but for those of you who have stumbled onto my page it will be a mystery... Unless you stumbled onto a later post and then made your way back to this one. In which case you ruined the surprise. But anyway, hope you like Typhus! It has certainly been a very busy hobby weekend for me! I don't know where the inspiration came from but I'm just not questioning it as I've gotten so much done and I'm still in the mood for more (unfortunately real life intends to get in the way of my inspiration kick and I've got to resist the urge to book time off work. 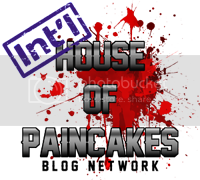 To kick things off; voila! 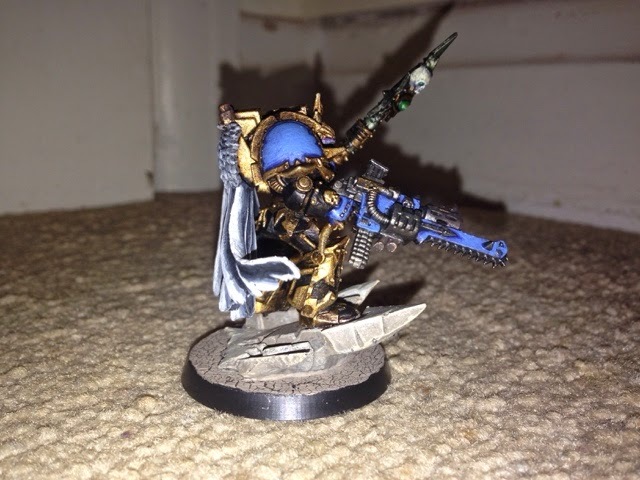 One Sorcerer of Tzeentch in Terminator Armour. In keeping with my green spot colour you'll notice that his staff is green and all the eyes are green too. The green of the staff was achieved with a little Waywatcher Green over silver (I wanted a noticeable but subtle colouring). I'm actually most surprised with how the rock he's standing on turned out as I wasn't sure if I'd be able to make it match the Agrellan Earth I used for the base. It was quite simple to do; Baneblade Brown with an edge highlight and drybrushing with Flayed One Flesh. I was shocked myself when it worked first time. While I'm loving the look of the cape/cloak/whatever I'm debating whether to repaint the fur. My original plan was to have it looking like a Fenrisian Wolf's fur but I don't think the effect is right. 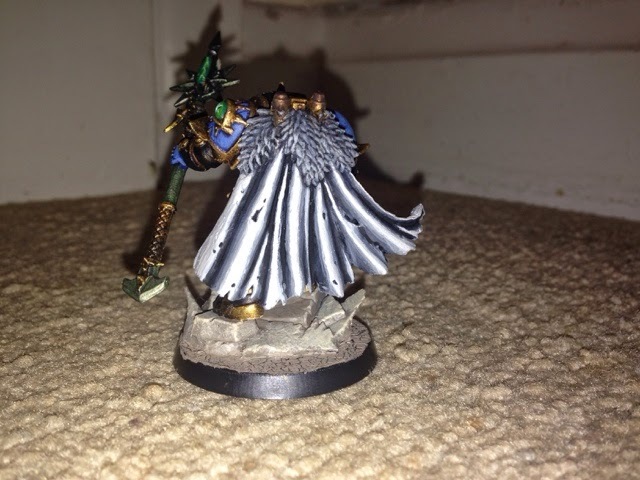 The idea behind this being to express the hatred between the Space Wolves and the Thousand Sons (according to my army fluff all of the Sons of the Cyclops were originally Thousand Sons) by proudly displaying a trophy from a battle but it's starting to look to me like he picked up a worn out rug and threw it on so that may be up for a repaint in future. 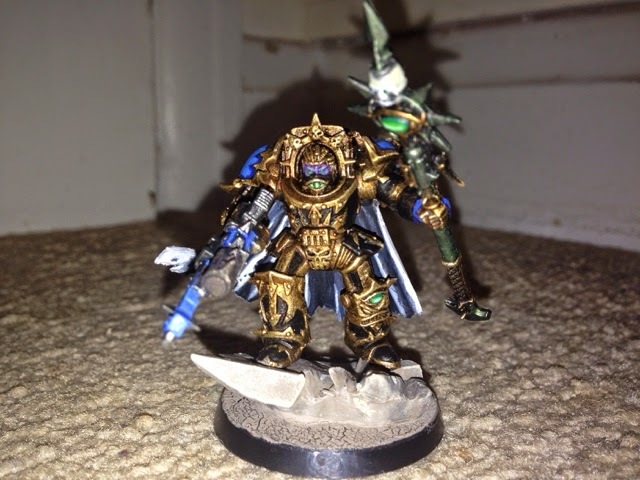 Everything else I've done on the model has been covered in other posts so I won't bore you with repetition but instead I'll just say that I've really enjoyed painting this guy and a lot of care went into him and this post has taken exactly the length of my commute to write. I'm off to a good start to the day I think. 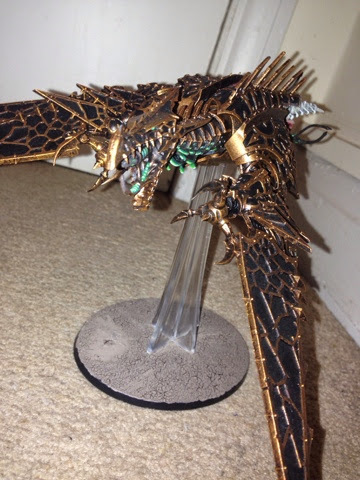 Oh yes ladies and gents, I finished the Heldrake and 10 Horrors! 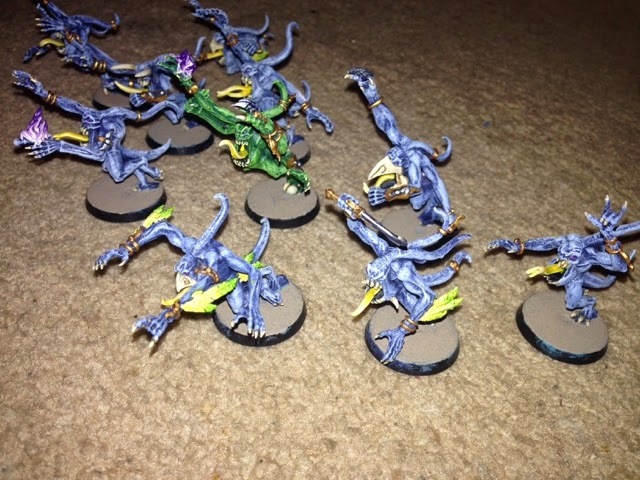 I'm also very near to completion with my Tzeentch sorcerer in Terminator Armour, started playing around with a few ideas for the Tzeentch Herald I don't like (I like the individual components I used to make him but I'm not keen on them all together), worked on an Abaddon conversion, fixed my Exalted Seeker Chariot (the clam pack Herald looks much better on that) and a few other bits too. 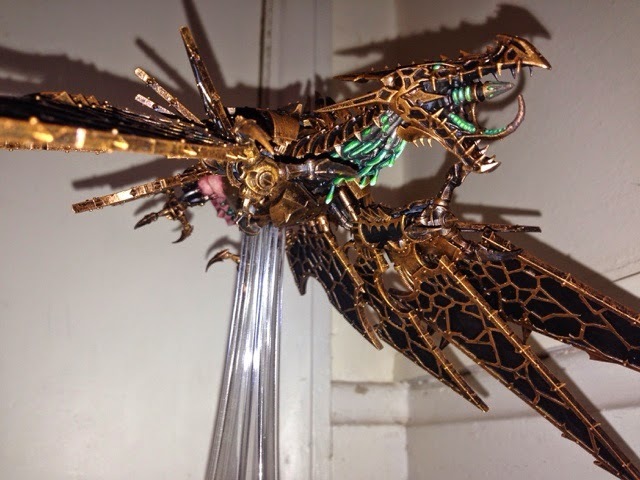 Starting with the Heldrake I think my favourite part of him is the wiring under his neck. Something clicked in my head this week and I knew exactly what I wanted to do with him and how he was going to look and this is the result. 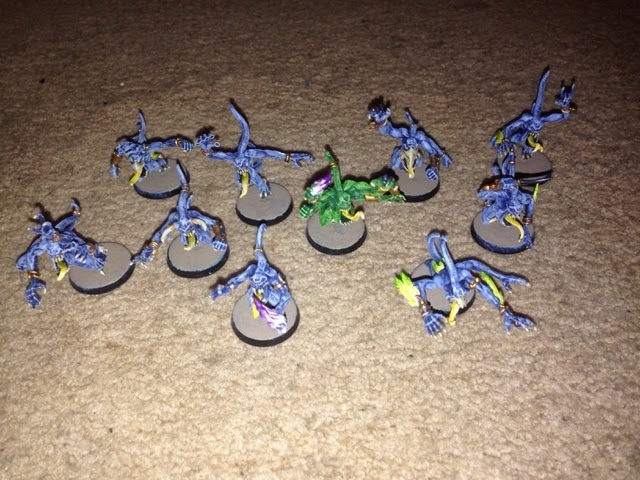 I've been using green as a spot colour for my army and helping to tie my more colourful units into the army (i.e. My cultists. The issue I had was that the green on the Heldrake needed to look more functional than decorative and the yellow highlights I was using for the infantry, while effective, didn't create the right effect for me and so for this I decided to not use any yellow whatsoever but used Gauss Blaster Green instead and I'm very pleased with the result as it looks like some form of energy source. I have a few plans for the base that may or may not require a hot glue gun but that's for another time I'm afraid. These guys were looking like they might be a problem for me because of my mental block with them last time and this time I couldn't get motivated to paint them at all. The problem being that I don't enjoy painting that much pink. 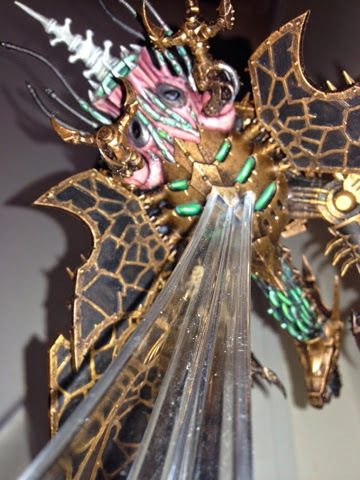 A little bit on a Slaanesh Chosen is fine but that much... I'm not a fan. I decided to shake it up a little and embrace change so I painted them blue and green which was obviously a good idea as I finished in around a week!! I decided not to do my usual fire with these guys as I wanted to try something a little different. It was my main thought while I was painting the Horrors and I still hadn't come up with a solution when I'd finished everything else so I dug around in my head a little. I had originally planned to paint these Horrors in purple (can't quite remember how they ended up blue) so I decided to create a little homage to the original idea and have purple flames. 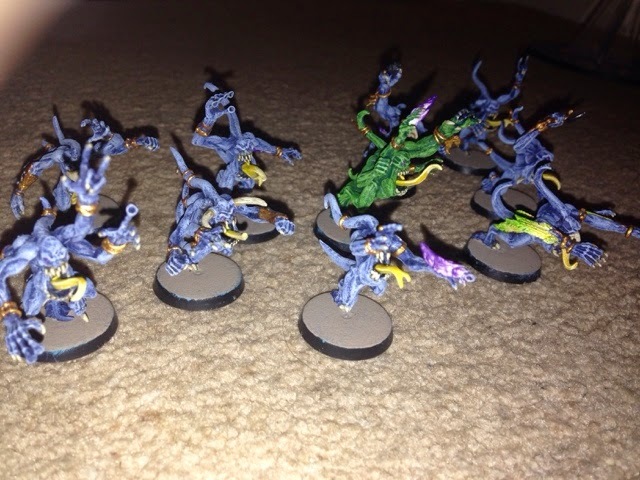 Their feathers were actually inspired by a suggestion by @wilsongrahams on Twitter while I was painting a Tyranid Termagant (more on that another time) who suggested that I look through the Lizardmen army book for some colour scheme inspiration. While I didn't find anything in there I liked for my Tyranids I did quite like how the feathers were done so I went back through my pile o' White Dwarf magazines to the issue from the Lizardmen release and lo and behold there was a quick and easy way of doing the feathers in a way I liked. Basically they were base coated in Ceramite White, given a Lamenters Yellow glaze and then Waywatchers Green was applied in thin coats to create a blend effect. So there we have it. 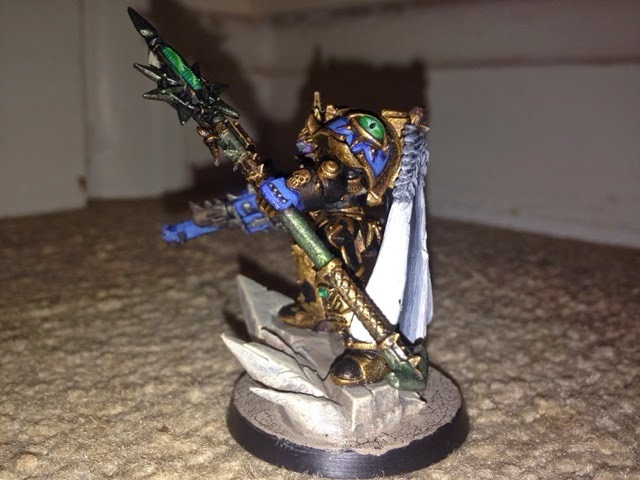 After posting this I plan to get some household stuff done (boring) and then crack on with my Tzeentch Terminator sorcerer. I just need to finish his gun and his staff and he's done (I may have gotten impatient and already based him...). So if all goes to plan then I may be powering through another chunk of my armies today.